assists roller (298) q.v. at back of rolling mill; lifts and handles heavy bars and sheets. cleans out, in vitriol, stampers' and silversmiths' work; swills articles in a solution of potash preparatory to plating them, and dries them in sawdust, after heating. assists gilder (282) q.v. ; duties similar to those of plater's assistant. attaches pieces of wire to articles to be plated, and hangs them in electrolytic bath; assists plater (282) q.v. generally. holds articles to be cleaned, after pickling process, against a power-driven scouring brush made of brass wire; may increase scouring action by dipping article into solution of caustic potash; may sometimes perform operation by hand, using hand brushes; cf. cleaner. helps generally at set mounter's bench (288); keeps solder pots hot; performs simple mounting operations, in process of learning trade. cements metal rims, etc., on glass articles, with plaster of Paris or other cement. (ii) general term for any worker employed in process of electro-plating, e.g., cleaner, scourer, potasher, dipper. washes and cleans plated articles, by hand, with brushes and clean water, after dipping process. 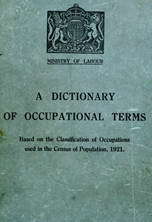 a plater's assistant q.v. who threads small articles to be plated on wire for plater (282) q.v. to hang from electrode in plating vat; after articles are plated and washed, dries them in vessels containing boxwood sawdust.